The Bessey AV2 Spacer is designed for laying parquet, laminated and panel flooring without any wedges. Spacer for floating laminate and parquet flooring installations. Easy to remove by simply turning back. 1 Clever dial Set up is fast and simple. Inserted between the wall and the first row of flooring, the distance to the wall can be set simply by turning the red dial. When the installation work is finished, the spacer is easy to remove; just rotate the dial to release the pressure. 2 Wide contact and support surface - Simply put, the pressure points on the wall and the flooring are avoided. 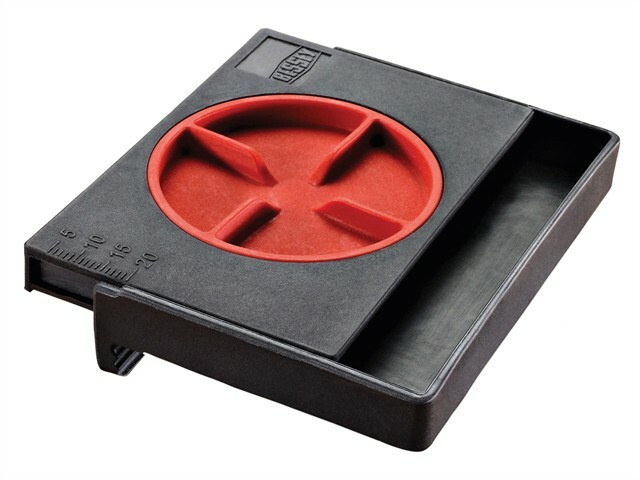 There is no danger of the aid slipping or tilting – as can happen with wedges or blocks – when working with the BESSEY spacer. 3 Exact millimetre scale. Wall surface irregularities of 5 to 20 mm can be compensated for easily. The exact distance required for spacing can be readily seen on the millimetre scale. 4 'Robust' in the size of a business card. Manufactured from impact and break resistant, glass fibre reinforced polyamide, the spacer is light and tough and should last for years.